Rear cover missing large piece. 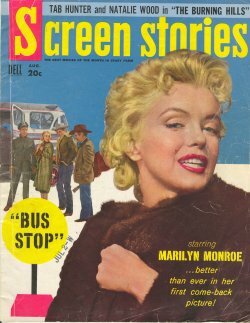 Cover depicts Marilyn and scene from Bus Stop. Feature Lewis and Martin, Jeff Chandler Away All Boats, High Society Grace Kelly, Frank Sinatra, Bing Crosby King and I Yul Brynner and Robert Wagner, and Tony Curtis.